One of the things I tried to do in this book was to give a 360 degree view of why this strike came about, why nearly 12,000 people risked not only their jobs, but their careers by walking out, and why several thousand of their coworkers did not join them. Here are reactions to the book from one who struck and one who did not. First off, Thank you for writing this book. 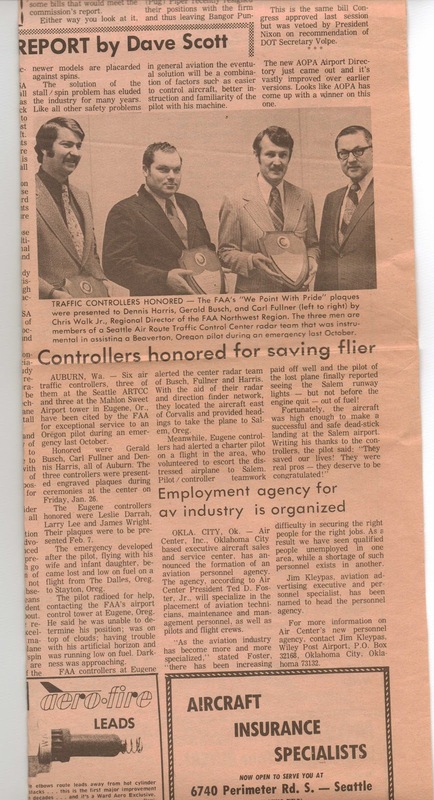 As a former president of Seattle Center (1972-1974) I was the one who won a successful de-certifying effort, followed by certification of PATCO at that facility. I was a HORSE in 1970, and a strike leader in '81. Over time it has been increasingly hard to explain our efforts to family and especially friends of the whats and whys of our strike. This book explains what went on extremely well. Again thank you for your efforts in this book, brought back a lot of memories of times and friends. Denny Harris Class of '81. 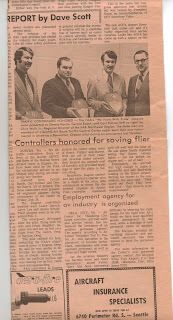 Denny also forwarded to me a clipping (left) of himself and two of his co-workers at Seattle Center receiving the FAA's "We Point with Pride" award for saving the lives of a husband, wife, and infant child in an air emergency. He's the guy on the left. This clip gives you a sense of the talent that was lost in the mass firing. If you'd like to read the clip, click here. Professor McCartin, I just finished reading Collision Course and wanted to tell you how much I enjoyed it. I was hired by the FAA in 1974 and was a journeyman controller in San Antonio in August of 1981. After much soul searching, I chose not to strike. Your book brought back memories and feelings I had not felt in a long time. From what I know and remember, you were right on target in Collision Course. Everyone who was a part of that experience has their own story to tell, and like a lot of others, I too wrote about my personal experience. After the strike was over, I eventually moved into management and spent the last 10 years of my career as the manager of Addison Tower, a VFR faciity in the Dallas Fort Worth Metro area. After Pres Clinton approved the re-hire of the striking controllers, I called the Southwest Region and said I would take any and all they wanted to send me and even tried to get a friend of mine who walked, rehired at ADS. I think the most significant thing I learned from those times was to avoid all the pettiness between the union and management. I am proud to say that when I was manager I rarely had labor problems and got along well with the controllers and my FACREP. 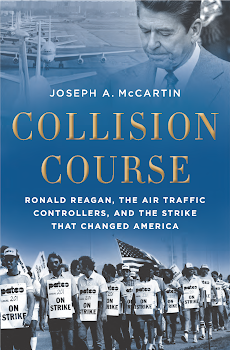 Well, that is probably a lot more than you ever wanted know about me :-) but you should know that I have started calling all my old FAA friends and insisting that they buy a copy of Collision Course! Let me conclude by saying thank you so very much for writing such an outstanding telling of the events that indeed changed America.